Due to overdue B2B invoices, 20.3% of respondents in Romania had to postpone payments to their own suppliers while 14.8% had to correct cash flow. Romania had a low proportion of B2B sales on credit and respondents here said they mainly opt for credit terms if they trust buyers and have built a long-term business relationship with them. The proportion of past due B2B receivables is one of the lowest in the region. Still, most Romanian suppliers said that past due invoices led to delay of payments to their suppliers and the need to take specific measures to correct cash flow. Only domestic B2B receivables here were written off as uncollectable mainly because the customer went bankrupt or out of business. In 2018, survey respondents in Romania were the most averse to selling on credit terms in the Eastern European region. Only 17.7% of sales have been made on credit, showing a clear preference for other payment methods. Similarly to their peers in the region, Romanian respondents seem more averse to selling on credit to B2B customers abroad than to domestic buyers (15.5% versus 19.8%). Additionally, the proportion of B2B sales on credit in Romania is significantly below the regional average of 36.9%. The primary reasons that respondents grant trade credit to their domestic B2B customers are loyalty and long-term business relationships. The fact that they trust customers also influences their decision to opt for credit. The main reasons for refusing credit sales to domestic B2B customers are the financial weakness of the customer and the customer’s poor payment behaviour (mentioned by 40.0% and 34.7% of respondents). We decided to grant trade credit because we’ve developed some good relationships in a sector in which we operated for a long time. We trust the people we collaborate with. Romanian respondents mentioned long-term cooperation as the top reason why they grant trade credit to B2B customers abroad. The decision is also aimed at increasing business with new customers and expanding international activity. Companies in Romania mainly refuse credit sales to their foreign B2B customers because of high economic and political risk in the customer’s country (mentioned by 28.6% of respondents) and because of the financial weakness of the customer (35.7%). We trade on credit with our foreign B2B customers to ensure future collaboration. Among the Eastern European countries surveyed, Romania had the lowest percentage of respondents (55.5%) who reported late payments by B2B customers in 2018. More than twice as many respondents in the country reported experiencing late payments from their domestic B2B customers than did regarding late payments from their B2B customers abroad. (76.2% and 34.5% respectively). Next to Bulgaria, Romania had the lowest proportion of overdue B2B invoices in Eastern Europe. This stands at 23.0% and is well below the regional average of 35.9%. The average proportion of domestic past due B2B invoices was far higher than that of past due foreign B2B invoices. In 2018, the average Days Sales Outstanding (DSO) figure recorded in Romania is 45 days. This is one of the lowest DSO figures in the region and well below the 59 days registered in the region overall. Most respondents in Romania (55.2%) do not expect any changes in their company's DSO over the coming 12 months. However, a significant percentage (25.9%) expect a slight increase. The average payment terms in Romania are in line with the regional average. Domestic B2B customers of Romanian respondents are given, on average, 34 days to settle invoices. Foreign B2B customers are given slightly longer, on average, 37 days. 2018 survey results do not highlight differences between average payment terms by customer type and this was also confirmed when 76.2% of Romanian respondents said that they are unlikely to differentiate. Of those who mentioned that they differentiate payment terms by customer, 12.7% said that they would give their domestic B2B customers less time to pay invoices while 11.1% said that they would give domestic B2B customers more time. The main reasons for differentiating payment terms in Romania are internal policies, industry practices and domestic payment terms dictated by law. Respondents did not report major differences in payment delays by their B2B customers. Domestic B2B customers delay payments, on average, by 13 days while foreign B2B customers by 11 days. Based on the survey findings, the average payment duration in Romania is 48 days, seven days shorter than what was reported for the region overall. Payment delays by domestic B2B customers seem to occur most often because of insufficient availability of funds. This was stated by 80.0% of respondents and is also the second highest percentage after that of Bulgaria. Respondents in Romania also cited the formal insolvency of the buyer (17.0%) and incorrect information on the invoice (15.6%) as the other main reasons for domestic payment delays. The main delay factor by B2B customers abroad was also insufficient availability of funds. 44.0% of Romanian respondents stated this, a higher percentage than for Eastern Europe overall (35.4%). Other reasons for payment delays by foreign B2B customers were disputes over the quality of goods delivered or services provided, the complexity of the payment procedure and inefficiencies of the banking system (each of these reasons stated by 16.0% of Romanian respondents). 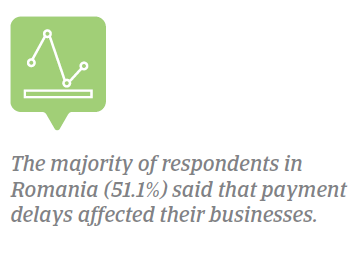 The majority of respondents in Romania (51.1%) said that payment delays affected their businesses. 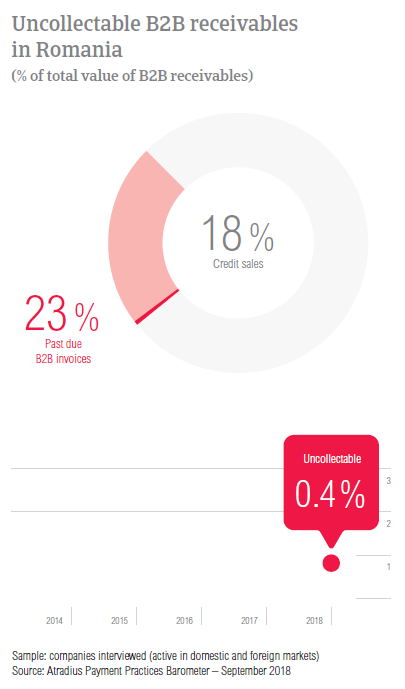 Due to overdue B2B invoices, 20.3% had to postpone payments to their own suppliers, 14.8% had to take specific measures to correct cash flow, and 13.2% reported revenue loss. 60.1% of Romanian respondents said that they are already invoicing their domestic and foreign B2B customers online and 2.0% said that they intend to start doing so in 2018. In contrast, 37.4% of respondents in the country said that they are not using e-invoicing and only 1.0% that they have stopped using it. 52.1% of respondents said that they received payments quicker and 47.0% of respondents that online invoices did not have a noteworthy effect on payment. A low 1.0% of respondents stated that they noticed a slowdown in payment duration. Survey respondents were asked to rank the following potential risks from the most significant to the least significant: US protectionism turning into trade war, misguided Fed policy, China’s ‘hard landing’ and geopolitical risk. Differently than their peers in Eastern Europe, Romanian respondents seem to perceive the misguided Fed policy as the biggest threat to finance and growth opportunities. 35.8% chose this as the most significant risk and an additional 27.2% that it’s indeed an important risk – even if not the most significant one. Additionally, with 19.2%, Romania had the lowest percentage of respondents who perceived US protectionism and the potential threat of a trade war as the most significant risk to global growth. 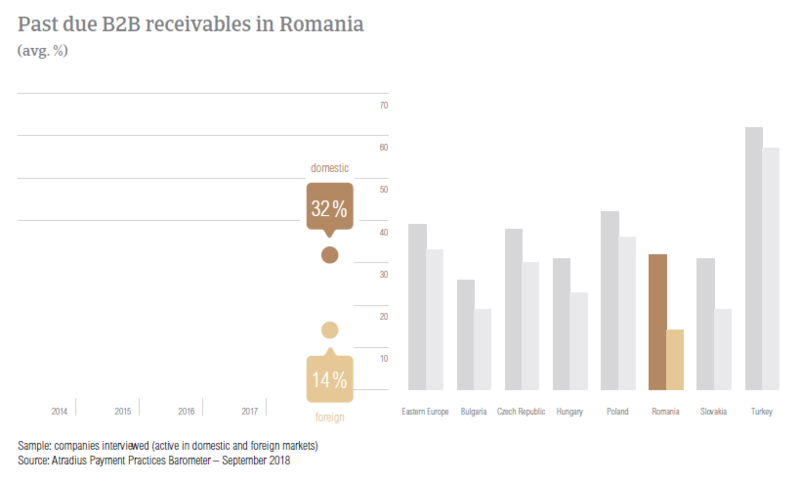 The average proportion of uncollectable B2B receivables in Romania is 0.4%, one of the lowest in the region next to that of Bulgaria. Only domestic B2B receivables here were written off as uncollectable. Uncollectable receivables originated most often from B2B customers in construction, consumer durables, food, business services and services. 71.8% of Romanian respondents said that the main reason for writing off B2B receivables as uncollectable is bankruptcy. This is the second highest percentage in the region after that in Slovakia. The second most frequently reported reason for write-offs is the failure of collection attempts, stated by 16.4% of respondents in the country. 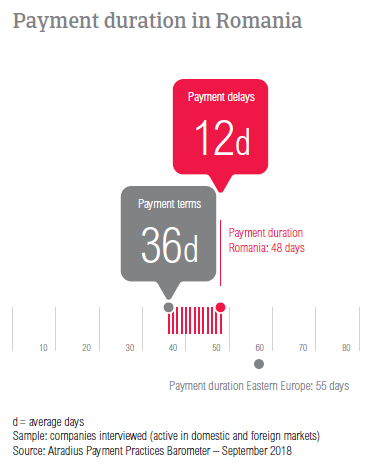 B2B customers of respondents in Romania are given, on average, 36 days to fulfil their payment obligations. Looking at the average payment terms by sector, domestic and foreign B2B customers in construction materials and in the construction sector are given the longest payment terms (on average, 46 and 42 days respectively). In contrast, B2B customers in the paper sector have the shortest average payment terms (on average, 20 days). Despite enjoying longer payment terms, B2B customers in the construction and construction materials sectors were some of the slowest payers. B2B customers in these sectors, paid on average 14 and 12 days late respectively. 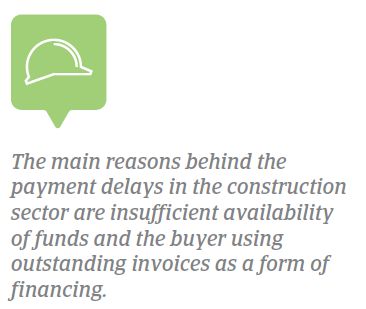 The main reason for payment delays is insufficient availability of funds, stated by 81.0% of respondents in the construction sector and by 78.0% of respondents in construction materials. When asked about the payment behaviour of their B2B customers in the coming 12 months, 54.0% of respondents in the construction sector said that they don’t foresee any changes. Of those who expect changes, 29.0% expect improvement and 18.0% deterioration. In respect to respondents in the construction materials sector, 36.0% do not expect changes, while 28.0% foresee deterioration and 36.0% an improvement in the payment practices of their domestic and foreign B2B customers.